1. What is the name of this surgical procedure ? 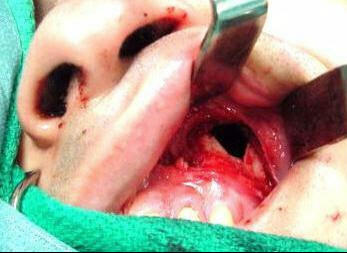 Reduction of fractured nasal bone. What is the test performed called? It is called Bulb press test. It is performed by applying pressure over eyeball and seeing the bulging movements of medial orbital wall. This test is positive in patients in whom lamina papyracea is eroded. It tells the surgeon on the table that the medial wall of the orbit is lost and the orbital fat is just a pick away. What is this procedure called? What structures can be studied? This is known as I pass diagnostic nasal endoscopy. 30 degree 4 mm nasal endoscope is used. Name the structures marked 1 and 2.